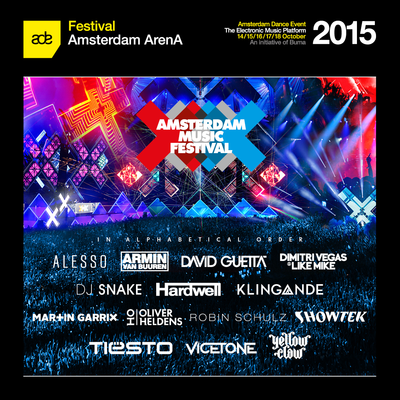 In 2013, two dance music event companies collectively brought the first edition of the Amsterdam Music Festival. This movement is now annually nestled in the heart of dance music’s most integral conference known as the Amsterdam Dance Event. Now, all eyes will be on Amsterdam again as on 16-17 October this year the Amsterdam Music Festival, the biggest event during Amsterdam Dance Event (ADE), will expand to a two day experience hosting a line-up of some of the world's biggest DJs. Joining current headliners Armin van Buuren, David Guetta, Hardwell and Tiësto are Alesso, Dimitri Vegas & Like Mike, DJ Snake, Klingande, Martin Garrix, Oliver Heldens, Robin Schulz, Showtek, Tiësto, Vicetone and Yellow Claw. This year, tens of thousands of music fans from across the world will unite, hoping to experience some of the best production, atmosphere, community and music all against a backdrop of the city of Amsterdam in the Netherlands. Held at Amsterdam ArenA, Amsterdam Music Festival is the biggest event of the 350 events during ADE with 2,200 DJs over 5 days and 80 venues and clubs.